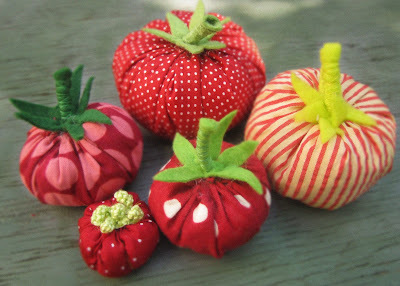 ust when you think that you might be going senile and you cannot cope because there is so much to do, make some fabric tomatoes! Really bonkers and completely useless, they are a good way of using left over fabric! ....and I do have alot of that! I ADORE these! Are they already in a bowl on your table? Darn! WHY are we not together?!!??!?! I am truly going through withdrawals! Are all the kids out of school? Is it hot there? Missing you sooooooo much... so so much. We MUST talk soon, before I go completely off! I have been DROOLING over your stuffed tomatoes and am just now able to comment on the computer. WOW! I could do a whole workshop on making them.....hello!!!!!!!!!! I am now back ay Jone's after 2 incredible days at Los Poblanos.......another big WOW!!!!!!!!!!!!!! We have so much to catch up on, I think a skype session is in tall order. Please let us know when we can do this in the next few days. Are you coming to Briancon?